Large vegan cookies that are perfect for bake sales. In the bowl of a stand mixer fitted with a paddle attachment, combine the nut butter, oil, sugars, milk, and vanilla. 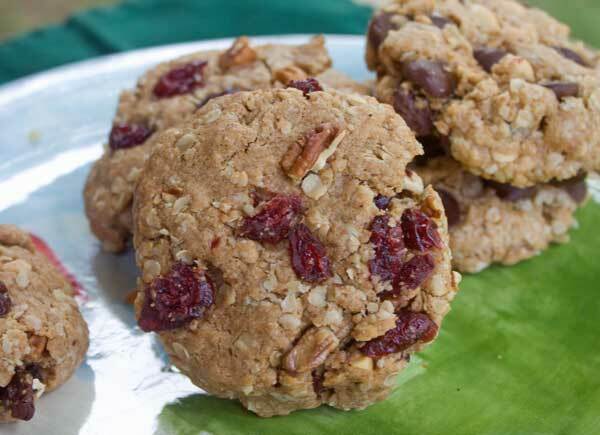 In a large bowl, combine the flour, oats, baking powder, salt,pecans, and cherries. Add the dry ingredients to the wet and mix to combine. Add extra milk, 1 tablespoon (15 ml) at a time, if the cookie dough is too dry and crumbly. It needs to be moist enough to hold together easily when pinched, without being too wet. Pack a 1⁄4-cup measure with dough (approximately 90 g per cookie, weight will vary with add-ins), place the dough on the sheet, and flatten slightly, because the cookies won’t spread much while baking. Repeat with the remaining dough, placing 7 cookies on each sheet. Bake for 14 minutes, or until the cookies are golden brown around the edges. Leave the cookies on the baking sheet for minutes before transferring to a wire rack to cool. Let cool completely before storing in an airtight container, at room temperature or in the refrigerator.